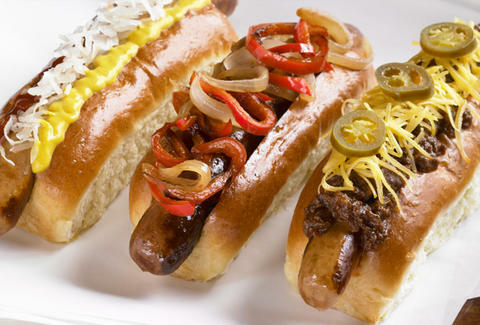 Not just how Randy Jackson describes his hair on rainy days, Fritzi Dog is a Farmer's Market stand doling out fully customizable hot dogs in various iterations, all, um, iterated by insanely accoladed chef Neal Fraser, who's usually known more for white tablecloths than yellow mustard. Literally everything's up to you -- to wit: Dogs: There're five to choose from, including The Porker (a curry-ish pig offering), Bird Dog (a dark meat turkey, duck, duck fat), the all-beef, classic-tasting Deli Dog, and their signature, which merges beef, pork, Chilean merken, and merguez, or what the gold and frankincense wisemen did when the third Magi rolled up. Buns: You can bury your meat in your choice of the Gluten Free (so... not that one), the Parker (a sweet, doughy number), a buttery Brioche, or the Pretzel, a salty, crunchy on the outside, soft on the inside dog-hugger, but not Dogg-hugger because Dre's mad busy with other stuff. Toppings: Everything's homemade from classics like sauerkraut and grilled onions, to bacon aioli, to Sriracha ketchup, to a crazy violet mustard -- put it on your dog and literally every American'll Idol-ize you.